Occupy Wall Street: Tahrir Over Here? Yahoo blocked emails related to the ongoing protests on Wall Street. Meanwhile, attendees have been dealing with another problem: American protest rallies rely on mass media, not social media. Just a few blocks away from Fast Company‘s NYC offices, hundreds of protestors have staged a demonstration under the banner Occupy Wall Street, which is loosely affiliated with Anonymous and Adbusters magazine. They’re recreating the tactics used by Egyptian and Tunisian revolutionaries and, in the organizers’ words, “us[ing] the revolutionary Arab Spring tactic of mass occupation to restore democracy in America.” There’s only one problem: If you sent an email about Occupy Wall Street via Yahoo, the recipient probably didn’t get it. According to Lee Fang of ThinkProgress, emails containing links to other activist websites such as the right-leaning americansforprosperity.org and teapartypatriots.org were not blocked. 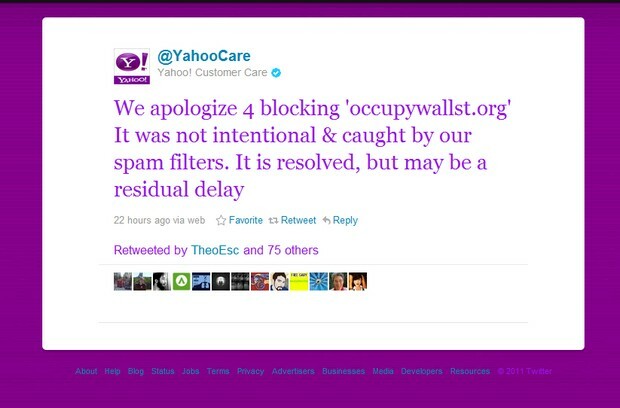 Yahoo themselves admitted that emails containing links to Occupy Wall Street’s site were blocked. In a Twitter update, they said it was “not intentional” and that the issue may be resolved. 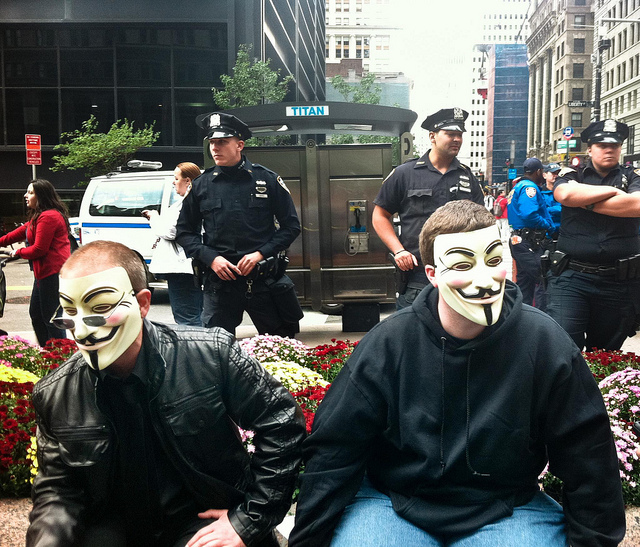 Users, however, might have “residual delays” in sending Occupy Wall Street-related emails. Yahoo’s email blocks may have been unintentional, but they looked remarkably similar to Egyptian censorship methods. 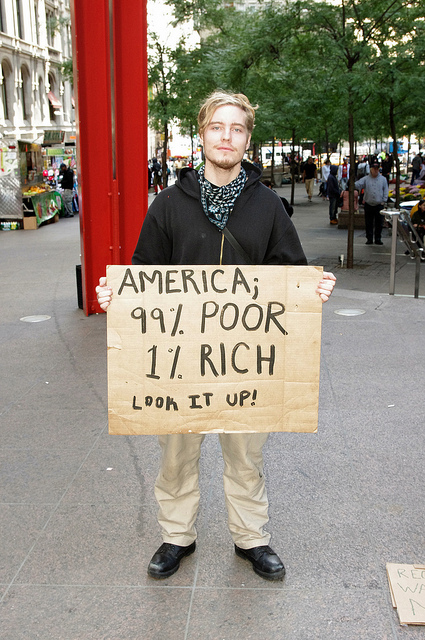 Occupy Wall Street’s non-organizers (the protest stresses its non-hierarchial nature) should be proud. In this one respect, Yahoo recreated Tahrir perfectly. Fast Company previously reported on the Mubarak government’s efforts to censor discussion of Tahrir via social media. Other email and social media services do not appear to be censoring conversation related to Occupy Wall Street. An unfounded rumor that Twitter was censoring content turned out to be false, both Gmail and Google+ are being used and Facebook contains a wealth of Occupy Wall Street-related content. The non-organizers of Occupy Wall Street face a much more serious problem: A combination of low turnout and allegations of police brutality. While New York police officers took a lassiez-faire approach over the weekend to the protesters, new video has surfaced showing the NYPD seemingly violently assaulting protesters who were required to move a tent. Meanwhile, despite the universal appeal of a protest for Wall Street to change its ways, attendees at Occupy Wall Street appear to mainly consist of professional left-wing activists and Anonymous-affiliated young people. The United States is not Egypt or Tunisia, and what the sociologists call “structural factors” are, in the U.S.A., totally different. America has one of the most vibrant civil societies in the world, with NGOs and interest groups for every conceivable cause. Politically engaged activists face surveillance at worst instead of the jail and police torture of the Maghreb. The unemployed are offered extensive government assistance that dulls anger at a sky-high unemployment rate. Easy access for nearly all economic classes to the Internet, video games, satellite television, and a million other distractions helps distract from discontent. Most importantly, nearly all successful mass demonstrations and gatherings of recent years in the United States relied on a top-bottom organizational structure in which participants were either bused in or convinced to travel on their own dime by the mass media. Across the ideological and seriousness spectrum, the Million Man March, Glenn Beck’s Restoring Honor Rally, the Tea Party’s Taxpayer March on Washington and the pro-immigration reform March for America all used variations on these two tactics. Occupy Wall Street’s non-hierarhical nature ultimately doomed the event’s inclusiveness. Unfortunately, Americans are a notoriously apathetic people. Effectively organizing large demonstrations in the United States requires a strong top-to-bottom organizational structure. There are tens of thousands upon tens of thousands of churches in the United States whose worshippers have been suddenly made economically irrelevant by the recession. Travel a few miles from Wall Street and there are whole neighborhoods where more than 15% of the population receives public assistance. Lobbying groups in Washington represent millions of Americans whose old jobs are disappearing and whose skill sets are not transferable–leaving them working low paying, part-time service sector jobs that cannot support their family. This is the right time in the United States for an economic justice rally representing everyone–not just tech-savvy young people or activists already plugged into a whole host of causes. There are justified reasons for every American, not just radicals, to be angry at Wall Street right now. Even computer legend Tim O’Reilly is riled up. Anonymous has also announced a DDoS attack on American financial institutions to take place today via the anonpad.org website. According to writers on anonpad.org, the Federal Reserve, Goldman Sachs, Wells Fargo, the Federal Reserve Financial Research Library, CitiGroup, Banca d’Italia, and the website of the City of New York will all be targeted.